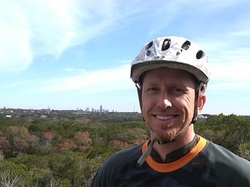 Jake is an avid recreational mountain bikers, currently based in Austin, TX. Jake has had the privilege of riding single track, bike parks, and downhill resorts all over North America, as well as working with land managers, mountain bike clubs, and communities all over the U.S. As a former member of the Subaru-IMBA Trail Care Crew, Jake spent a year traveling all over the country teaching mountain bikers, land managers, and policy makers about sustainable trail building, effective advocacy, and the health and economic benefits of natural surface trails and mountain biking. This also gave Jake a wonderful opportunity to train under and work with some of the top professional trail builders in the world. Jake has been working since 2012 as a professional trail consultant, providing trail building services such as strategic planning, conceptual designs, field designs, construction, maintenance-repair, and training services. Jake is one of a select group of Instructor Trainers for the IMBA Instructor Certification Program (ICP), traveling all over the country to teach the certification courses and certify new instructors. Jake is a certified IMBA ICP Level 3 Instructor, having had the amazing experience of training under the great Shaums March, two-time downhill masters world champion, all-around decorated professional rider, and master coach.A life long student, Jake continues to seek out and receive training from other professional instructors and companies. Jake also has a history of BMX racing and freestyle from his teenage years that he keeps alive through dirt jumping and pump track riding. Despite everything he has experienced, Jake feels there's always more to learn!